ALEX: Our subscription model is designed to make purchasing and using our software more convenient for our customers. CUSTOMER: How is paying for this software over and over and over again more convenient? 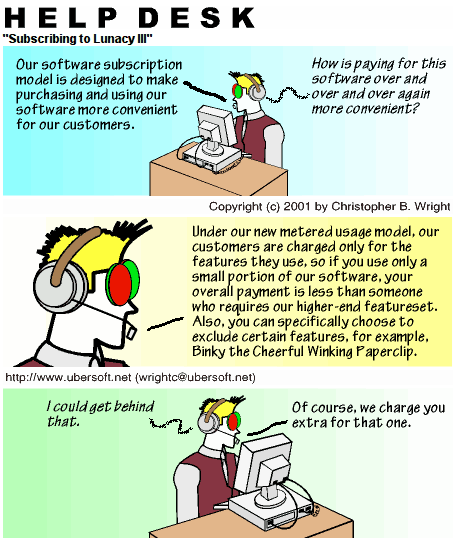 ALEX: Under our new metered usage model, our customers are charged only for the features they use, so if you sue only a small portion of our software, your overall payment is less than someone who requires our higher-end featureset. Also, you can specifically choose to exclude certain features, for example, Binky the Cheerful Winking Paperclip. CUSTOMER: I could get behind that. ALEX: Of course, we charge you extra for that one.